We live in the 21st century, also known as the digital age, where technology is an integral part of everyday life. In order to compete in today’s market, business owners must embrace that reality. For some small business owners, the prevalence and rapid rise of technology in today’s society may seem a little scary. It can be hard to keep up with the ins and outs of new tech. But once you are able to target specific aspects of modern tech that work the best for your small business, you’ll quickly discover that the benefits are enormous. One of the biggest benefits comes from the fact that digitizing your business actually saves you time, and as you’ve undoubtedly heard before—time is money. Did you know that the average business owner spends 68% of his time dealing with day-to-day tasks rather than actually developing his business? Does this sound familiar to you? Are you looking for a solution that can help your small business optimize operations and gain a competitive edge? Here at Tuxedo Impressions LLC™, we aim to offer our clients with the best solutions to fit the needs of their small business. In this article, we’ve listed a few resources that you might find beneficial in certain areas of operation in your small business. When it comes to dealing with paperwork and clients, it can be difficult to get documents signed in a timely manner. Whether you are mailing the paperwork, faxing it, or requesting the client to come into your office to sign it in person, there are any number of delays that can occur that will keep you from being able to move onto to the next step in your process. Have you ever stopped to think about how much time is wasted waiting on signatures or feedback for paperwork? The longer you have to wait for your client to find the time to sign paperwork and send it back to you, the more time you lose on being able to deliver your product or service. Now, if we were to digitize this aspect of your small business operation, you could use software like Adobe Sign to upload a copy of your proposal, service agreement, or contract. Once you’ve uploaded the file, you can send it to your client, and upon reviewing the document, she can sign the document electronically. No printing or hunting down pens necessary! Because most people carry their smartphones or laptops with them everywhere they go, you are essentially able to get the document to your customers wherever they are, and in most cases, you can receive a signed copy almost immediately. This drastically reduces your business’s wait time, so that you can move onto providing the service that you do best. When you hear the word “accounting”, you probably envision someone hunched over a desk switching back and forth between a computer and a calculator, typing in numbers for hours upon hours. Accountants have to manage what money is coming in and going out, and sometimes it’s not easy to keep track of all of the receipts, let alone track down clients who are delaying in payment. This is why software packages like Freshbooks are such a great source of support. Accountants can use the software to create professional looking invoices that are customized to your small business. They can also automate follow-up reminders and thank you emails, connect directly to the business’s bank account so that purchases are automatically updated, and they can even upload pictures of receipts to the cloud so that there is never worry of a receipt getting lost. The days of tedious manual entry for accountants are coming to a close with great software like this! One commonality between many small businesses that have not yet transitioned into the digital world is the presence of lots of folders and file cabinets at their site of operation. No matter how organized the system may be, it can be time consuming to have to search through cabinets for a specific document. There is also the issue of original documents getting lost or destroyed without any form of backup. Some people prefer to have hard copies of documents, while others prefer to do everything from the computer, and there is nothing wrong with either of those approaches. But it is important to always have a backup. Even if you keep digital copies of documents on computers in your small business, there is still no guarantee that you won’t lose all of your important paperwork if your computer crashes. That is why the cloud exists. The cloud is basically an online storage site where you can store all of your documents and data on server space that can never crash. We use applications like Google Drive and Box for document storage. They not only offer all the data space you may need, but they also provide security measures that protect your privacy. By utilizing a resource like this, you can ensure that all of your documents are safe, secure, and available whenever and wherever you may need them. 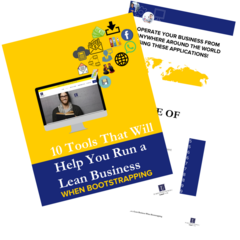 There are many other types of resources available to help you streamline your business’s workflow. If you are interested in learning more about how you can digitize operations for your small business, Tuxedo Impressions LLC™ is here to help. Contact us today.